The AgDNA precision crop management tool for mobile devices is taking the farming world by storm. Since AgDNA was launched by founder Paul Turner less than six months ago, the cloud-based program has registered users in more than 80 countries with six million acres of farmland boundary mapped. The growth rate of one million acres a month is set to accelerate with the launch of a version for Android smartphones and tablets to complement the original system developed for iPhone and iPad. To help build international penetration, AgDNA was showcased at the world’s biggest farm machinery show, Agritechnica, which attracted more than 450,000 visitors to Hanover in Germany in November. “Our mobile farming platform has excited a lot of interest and feedback in the European farming community,” Mr Turner said. The intuitive software is a free download from the AppStore or Google Play and can be used for a number of applications each month at no charge. Inexpensive subscription plans are available for larger farms and power users. Mr Turner said the technology had unique features, including the ability to track machinery operating in the field in real time using the mobile device’s GPS, linking multiple users to a single account and displaying season activities for each field. “It allows farmers to make full use of the ever increasing amount of electronic data being generated in modern agricultural systems. “It brings all this data together in a usable form to help the farm business run more smoothly,” said Mr Turner who has an extensive background in precision farming and was a pioneer in the development of GPS auto-steering technology in Australia and the USA. New data only needs to be entered into the AgDNA system once and if there is no internet connection it automatically uploads when the device comes back into range. “The program can be accessed by multiple operators, including work groups in the field, agronomists and advisers, in packing sheds and processing facilities. “This makes for easy planning and coordination of farming activities,” Mr Turner said. Once the field boundaries on a property have been mapped or imported other information such as soil profiles, irrigation and fertilser applications can be overlaid to provide a complete picture. Weather data can also be added to build a detailed history of how individual crops have performed across the seasons. “We are working closely with machinery manufacturers so that electronic data being generated on crop yields or fertiliser application or spray rates can be readily up loaded to the AgDNA program. “A lot of this technology is now invisible. The capability is built into the machinery and it is just a matter of collating it all into a format that the farmer can use to help in their decision making. “AgDNA is an extremely powerful farm management tool when all the data comes together. Information that might otherwise take months to assemble can be captured as it is generated,” Mr Turner said. All the data is stored in a secure account on the internet where it can’t be lost or corrupted, with access password protected. “The potential productivity gains, improved yields and timely access to critical farm data using mobile devices and connected data services is huge. “AgDNA is quickly being recognised as an industry leader in this space and we are committed to helping growers around the world to access their farm data wherever and whenever they want,” Mr Turner said. 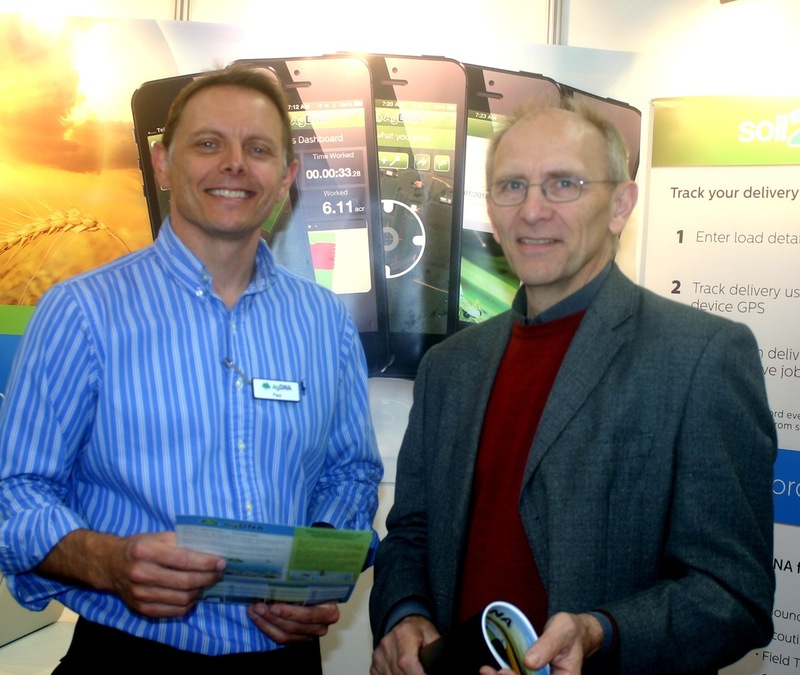 AgDNA chief executive Paul Turner with a visitor to the Agritechnica farm show, Dr Armin Werner, manager of precision agriculture with Lincoln Agritech in Christchurch, New Zealand. This entry was posted in Uncategorized by agdna. Bookmark the permalink.